Many, if not all of us, can remember priests who have touched our lives. Author Daniel Conway uses his first novel, Father Turiddu: The Savior of the City, to shine a light on a priest who has left an indelible impression through his life of faith. 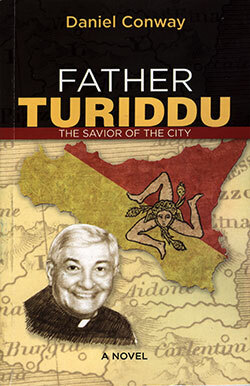 Though the book is a work of fiction, Conway admits that he modeled the main character, Father Salvatore E. Turiddu, after the life and ministry of Msgr. Salvatore Polizzi, an 82-year-old priest who serves as pastor of St. Roch Parish in St. Louis, Mo. Known throughout the Church for his more than 25 years of experience in helping Catholic organizations in strategic planning, communications, stewardship education and development, Conway—who currently serves as senior vice president for planning, marketing, and advancement at Marian University in Indianapolis, and occasionally writes editorials for The Criterion—said his friendship with the St. Louis priest goes back more than two decades. A similar pastoral planning process began soon therafter in St. Louis, and Conway was invited to work with Msgr. Polizzi and a committee of archdiocesan leaders to develop a strategic pastoral plan for the Church there. About 15 years later, at St. Louis Archbishop Robert J. Carlson’s invitation, Conway returned to St. Louis to work on an initiative to strengthen Catholic schools. During that time, he again saw Msgr. Polizzi live out his priesthood. As shared in the novel, the author experiences firsthand the priest’s passion for his family, Church and the community that he serves. It is Father Turiddu, known as “Father T,” that city leaders and local and national law enforcement officials turn to in the book when domestic terrorists threaten their community. “Who’s Father T?” the U.S. attorney asked the FBI’s chief field agent after he hears the city’s police commissioner say he will call the priest to help with the case. “That’s Father Turiddu, a Catholic priest. He’s called il salvatore della città, the savior of the city,” the FBI agent said. “Savior of the city? Why?” the U.S. attorney asked. Before taking on this latest “assignment,” it is “Father T” whom parishioners, fellow priests, family members and residents of the community turn to when they are in a bind. When the priest shares his patented “End of story” in a conversation, readers will know that Father T means business and will take on—without hesitation and with absolute trust in God’s grace—whatever challenge awaits him. As you read the story, you will see a priest whose vocation is at the heart of all he does. And in the end, … well, let’s just say this fast and enjoyable read will make the time you spend on it worthwhile. One thing we can reveal is that, with his Italian roots, Father T—like Msgr. Polizzi—loves to cook and entertain others. Although Conway didn’t tell Msgr. Polizzi that he was writing a book based on him, when it was finished, the author gave the priest a copy and said that he would change anything in it that Msgr. Polizzi wanted. How will Conway know if his novel is successful? “If Msgr. Polizzi’s story is still being told for the next 100 years—for the enjoyment and inspiration of many generations of people who have never had the privilege of being a member of his family, his parish or his very wide circle of friends,” the author said.